The Plastic Surgery Center of Leo R. McCafferty M.D., F.A.C.S. 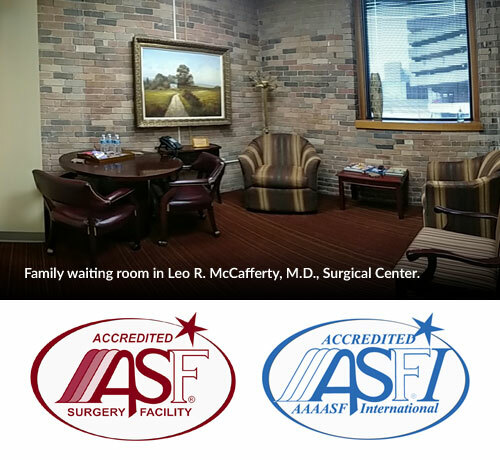 The safe, private and comfortable surgery center, based in the office of Dr. Leo McCafferty, provides clients with a convenient alternative to a hospital visit. Because we are globally accredited by Surgical Facilities Resources (SFR), nationally accredited by the American Association for Accreditation of Ambulatory Surgery Facilities (AAAASF), and licensed by the state of Pennsylvania as an Ambulatory Surgical Facility, you can rest assured our surgery center not only meets or exceeds all agency requirements; we offer you the highest quality, most up-to-date expertise in the field of aesthetic cosmetic surgery. Dr. McCafferty also is credentialed and has full hospital privileges for every cosmetic procedure should you prefer your procedure be performed in a hospital.